We are proud to power over 1.5 million Ecwid stores registered around the world. We know that each one operates uniquely to best serve its customers. That’s why we are pleased to host the Ecwid App Market, where merchants can expand their e-commerce capabilities with just a few clicks. We regularly feature handy, interesting apps from the market on our blog to help you find something to complement or supplement Ecwid’s e-commerce features. We’ll give you an overview of what each app is about, how it might benefit your business, and how to get the app running on your own Ecwid store. Today we are profiling two apps by one developer: Swell Rewards and Swell Analytics. They’ll work together such that Swell Rewards will drive viral traffic to your site, and Swell Analytics will help you organize the sales data that all this new traffic will generate. Why should I use Swell Rewards and Swell Analytics? Swell Rewards not only incentivizes people to buy again from your store by awarding points for purchase-related activities and referrals, but it also allows you to engage your customers between purchases, with campaigns designed to increase your social media presence, newsletter subscriptions, page visits, and more. Furthermore, Swell can also integrate seamlessly into physical storefronts for merchants who operate in a brick and mortar capacity as well. This is the great news for business owners, as customer retention is paramount for running a successful business—a 5 percent increase in customer retention can increase your company’s profitability by 75 percent. Just like a pilot uses a specialized instruments to know an airplane’s altitude, speed, and bearing, you should use an analytics engine like Swell Analytics to better understand how your customers are interacting with your store, and how you might better optimize its operation. 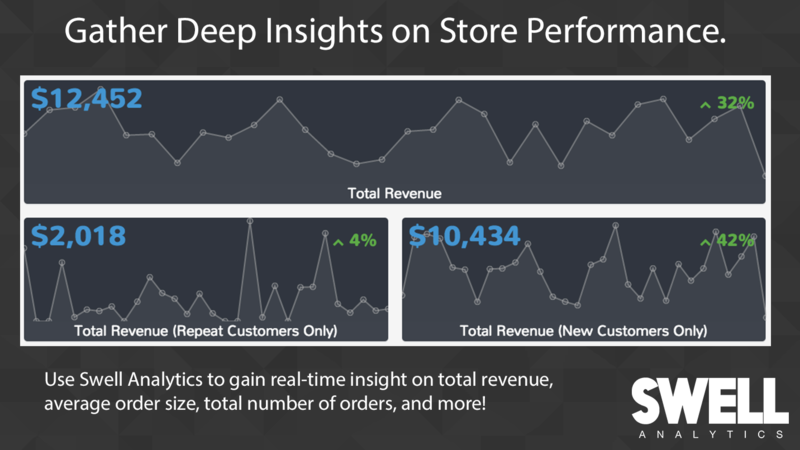 The app provides you with a series of dashboards that give you elegant representations of trends in store revenue, repeat customers, average order size, and so on. Such metrics are essential to know and track over time. Your time is limited and knowledge is power, and analytics on this level help you make better decisions more quickly. Lack of information too easily turns into lack of time and money; having an array of objective statistical data at your fingertips can help you optimize anything from a marketing spend to how well-stocked a certain item needs to be on a regular basis. The data in Swell Analytics is made more valuable when an app like Swell Rewards helps you take action to actively improve upon your most critical metrics. It will help you better know your average customer and identify new strategies for marketing to them. For example, if most of your business is comprised largely of new customers, you’ll want to take the steps to turn them into returning customers. Regardless as to whether you operate solely via a website or through a brick and mortar store as well, Swell Rewards has campaigns to help you do just that, including awarding points when your customers spend a certain amount, make a certain number of purchases, refer their friends, and much more. Using Swell, your customers will form a deeper, stronger bond with your store. How do I install Swell Rewards and Swell Analytics? Simply go to the their pages in the Ecwid App Market (here’s Swell Rewards, and here’s Swell Analytics) and get started today! Swell Analytics is fully-featured and is 100% free. There are no extra premium features or hidden charges. Swell Rewards offers optional premium plans starting at $49 per month, but even large e-commerce operations can benefit from its unpaid level of membership, which grants you access to a variety of campaigns to help drive store revenue and boost traffic to your site. The paid tiers allow a higher degree of customization for your campaigns and the ability to maintain data a larger stable of shoppers. If you want to implement Swell’s easy-to-use rewards program for 500 customers or fewer, there’s no charge for the software. The $49/month plan allows you to customize the look and feel of the rewards program to better match your store’s layout and color schemes. The $249/month plan allows you to place a customized Rewards page on your Ecwid store, completely white label the rewards program for your site, and use Swell’s mobile app to reward your customers both in-store and online. The $999/month plan includes highly-customized email marketing features to better fit your brand as well as custom development work from Swell’s world-class engineering team, including tailored campaigns, custom reward screens, and more! All Ecwid apps are created by talented developers who use the Ecwid API, which allows them to extend, customize, and build on the Ecwid platform to make amazing e-commerce apps. Are you a developer? Build something with our API today!